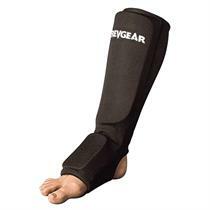 These stretchable shin and instep guards are extremely comfortable and adapt to legs of all sizes. If you've had trouble finding a well fitting pair of shin guard, these pads are the right choice for you. Constructed out of foam padding and elastic, nylon covering, these pads are machine washable and very user friendly. Email your friend about the Stretch Shin Instep Guard. Ask a question about the Stretch Shin Instep Guard.